We offer our HOP-TYE® Conversion in wonderful colour combinations or with applications or embroidery. From brightly coloured to plain and simple – we have both to offer, and you will surely find your personal favourite. The HOP-TYE® Conversion is a carrying aid from birth up to approx. 2.5 years. 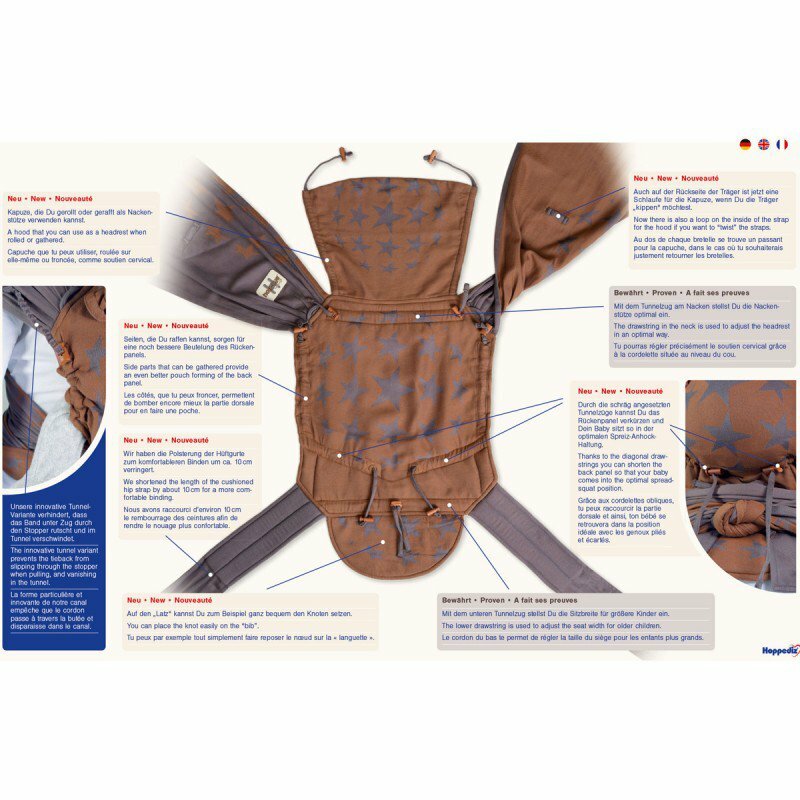 You can use the HOP-TYE® Conversion for front and rucksack carrying. The detailed and illustrated carrying instructions being supplied with each HOP-TYE® show step by step how to tie our HOP-TYE®. You may order even our carrying instructions separately. A hood that you can use as a headrest when rolled or gathered. Side parts that can be gathered provide an even better pouch forming of the back panel. We shortened the length of the cushioned hip strap by about 10 cm for a more comfortable binding. The innovative tunnel variant prevents the tieback from slipping through the stopper when pulling, and vanishing in the tunnel. You can place the knot easily on the “bib”. Now there is also a loop on the inside of the strap for the hood if you want to “twist” the straps. 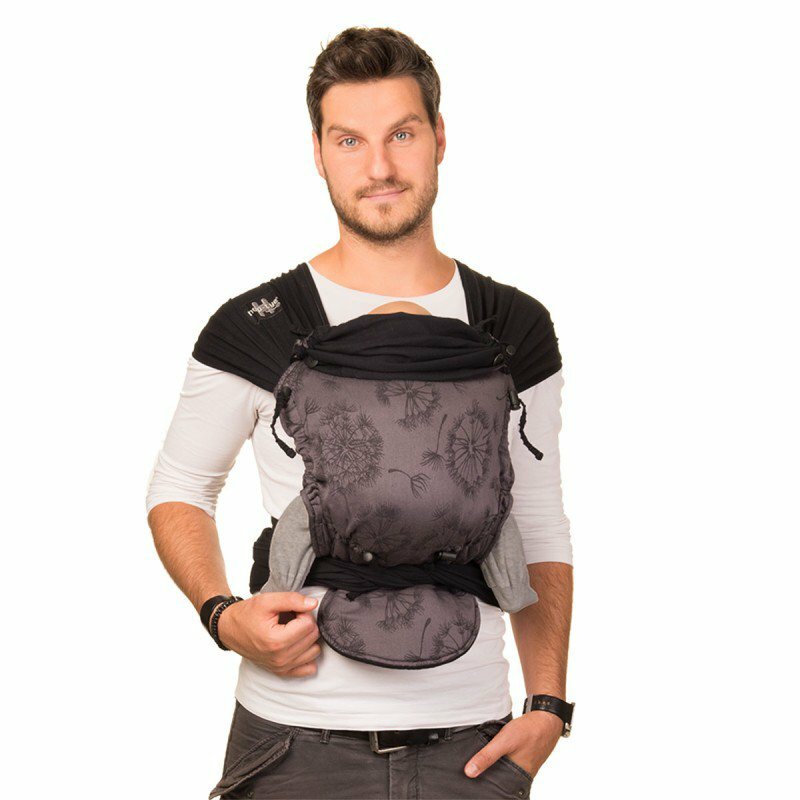 Thanks to the diagonal drawstrings you can shorten the back panel so that your baby comes into the optimal spreadsquat position.